Mardi Bras, Game Tickets & Cookbooks… Oh My! 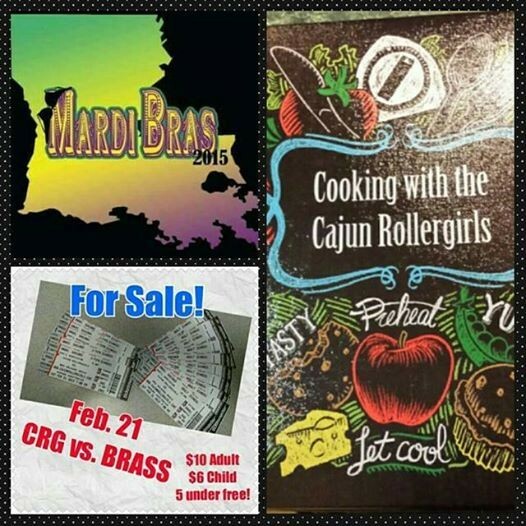 Your Cajun Rollergirls have a lot going on this February! First off, we’re collecting items for the statewide derby Mardi Bras drive. All donations will be given to The Haven. You can drop off donations at many locations in the Lafourche/Terrebonne parish area. Scroll down to our previous post to see all of the locations helping us out! We also have tickets for sale for our season opener on Saturday, Feb. 21 versus the New Orleans Brass men’s league at Big Warren in Thibodaux! You can get your tickets at a discounted rate from CRG members, but hurry before that deal is over! If you miss it, you can still get tickets through Ticketmaster or at the door. We also still have our CRG cookbooks for sale, featuring 200 recipes submitted by your favorite CRG members! They make great gifts. With Valentine’s Day coming up, you can use it to cook a wonderful meal for that special someone (wink, wink). Each book is only $20. Get yours today! Happy Birthday to Selena D. Crash & Corey Jams! Happy birthday, Green Dragon!